Home › Sociology › gender & feminism › Submit for the Fourth Down Under Feminists Carnival! 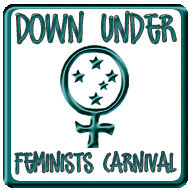 Last chance to submit for the Fourth Down Under Feminists Carnival! This carnival will be hosted at Blue Milk. You must submit by the end of the month. Any feminist blog post from Australia or New Zealand is eligible – yours, or those you’ve enjoyed reading. You can find the carnival information page just by clicking the sidebar button, and I encourage you to use the sidebar button and link at your blog to support the carnival. I hope you’ll all find some new reading and make some new blog connections through this carnival. Lastly, we need a host for the Sixth carnival, which should be published in the first week of November; and we need hosts for next year. Anyone? I could host a carnival.